HAND CRAFTED: Jo Stephen pushes the wine glass into shape. 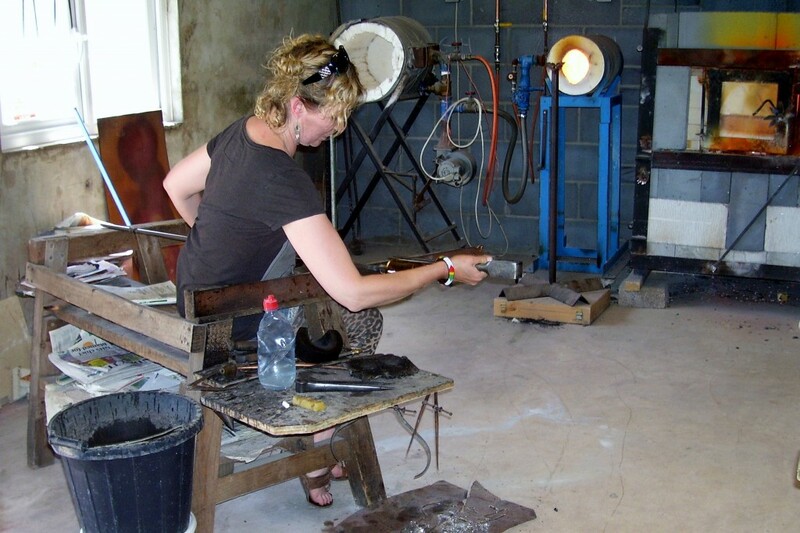 TURNING CENTRE: Jo carefully turns the glass on a iron rod in the middle of the furnace. 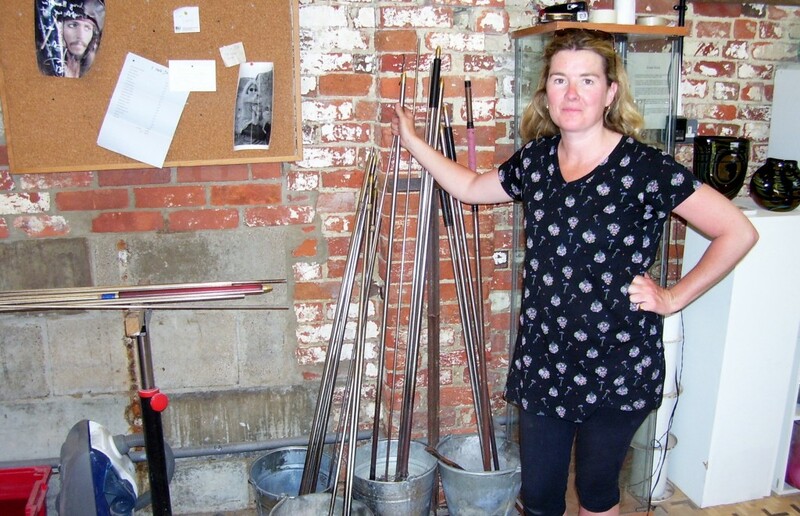 GLASS TOOLS: Emsie Sharp, at her studio in Child Okeford with some of the iron rods used to turn the glass in the furnace. A GLASS blower made a set of wine glasses in the space of two hours inside a literal oven on a hot summer’s day. After completing her studies at the West Surrey College of Art and Design in Farnborough, Emsie Sharp spent three years on the Isle of Murano, Venice, assisting in the creation of wine glasses and chandeliers. Since returning to the UK in 2002, she has run a studio in different locations in Dorset and is now based at the Cow Shed, Gold Hill Organic Farm, Child Okeford, and she is assisted by Jo Stephen. 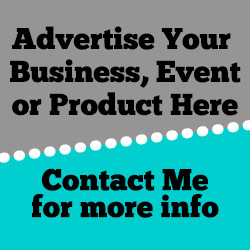 Emsie said: “I have been in the trade for 20 years. I didn’t do any glass blowing before I went to art college in 1993. This blog went to visit Emsie and Jo at Emsie’s studio and the following process unfolded. When the glass was blown, a ball of melted glass is placed on the end of a hollow iron tube and cast into a specifically shaped mold. The glass is then blown into this mold and water creates a jacket of steam around the hot glass and gives the item its silky smooth surface. Once the body is shaped, piece specific details are added before cooling and every neck and every decanter is formed by hand. The wine glass had a stem added and is shaped again entirely by hand. When Emsie or Jo finish the piece, it is allowed to cool and is broken free from the glassblowing pipe and placed in an annealer that enables a slow cooling process to prevent the glass shattering. Soda ash, silicon and lime are the main ingredients of the glass but barium sometimes is added to enhance the glass’s brilliance and boron to increase heat resistance. Recycled glass is also frequently used and is called cullet. Emsie was commissioned by the BBC, in partnership with the National Trust, to produce some Georgian-inspired wine glasses to coincide with a documentary called The Manor Reborn, which covered the restoration of the 500-year-old Avebury Manor in Wiltshire. Wine glasses can be blown to order in the form of flutes; Georgian-style glasses; glasses with a blown foot or in different colours. Glasses are by no means the regular items made – tableware in the form of tumblers, carafes and jugs can also be made in different shapes and colours. Other items that can be made to order are pear drop lamps, baubles, cube lamps, pebble lamps, vases, drawer knobs and paper weights. 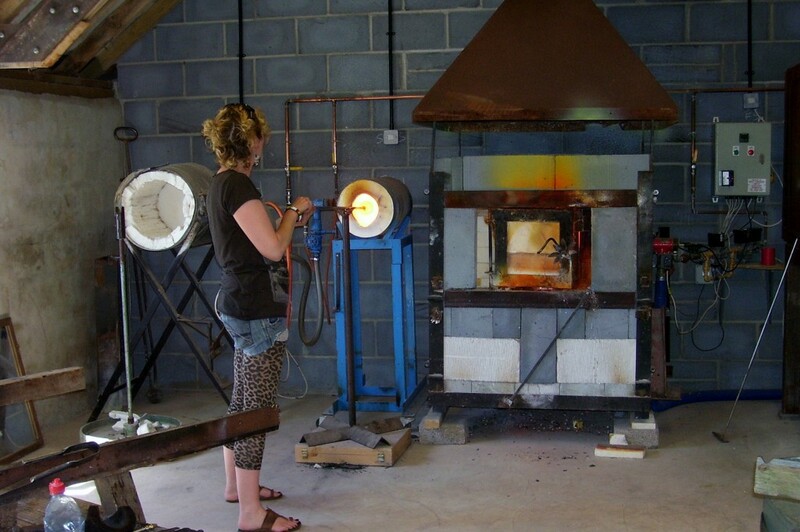 People can also do one-day courses learning about the traditional methods of glass blowing; bauble or paper weight half days or private tuition and studio hire.